What is Not Quite Right? In a land of crushing poverty with a brutal climate, a high rate of disease, and a notorious dictatorship, it might be strange to confess that one of the things most troubling to me in Sudan was its graffiti. While I started to gain an appreciation for Arabic graffiti itself (noticing some strange juxtapositions between imported Rasta culture, with images of Bob Marley combined with a Muhammad-like veneration) the stuff that most affected me involved the relics from ancient days. 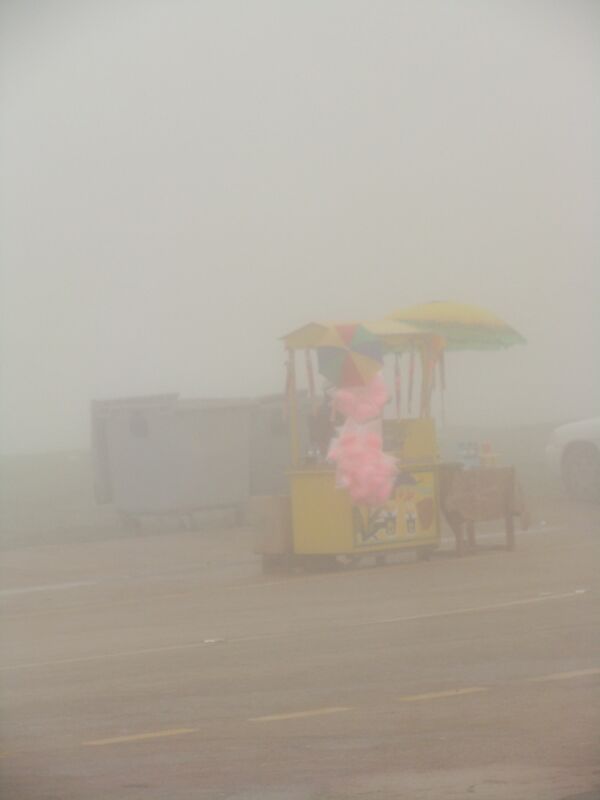 Cotton candy vendor in the mist at Job's Tomb -- Salalah, Oman. The Not Quite Right element in this post is almost painfully obvious: a cotton candy vendor (among others hawking everything from nuts to clothes) has set up his cart just outside the gates of what might be the most historically plausible of several locations that claim to inter the remains of the Biblical Prophet Job, or An-Nadi Ayoob as he is called in the Qur’an. What might not be so obvious, but are undoubtably also NQR moments, are two other things about this location and time: the rain and the extreme length of Job’s green-draped sarcophagus. 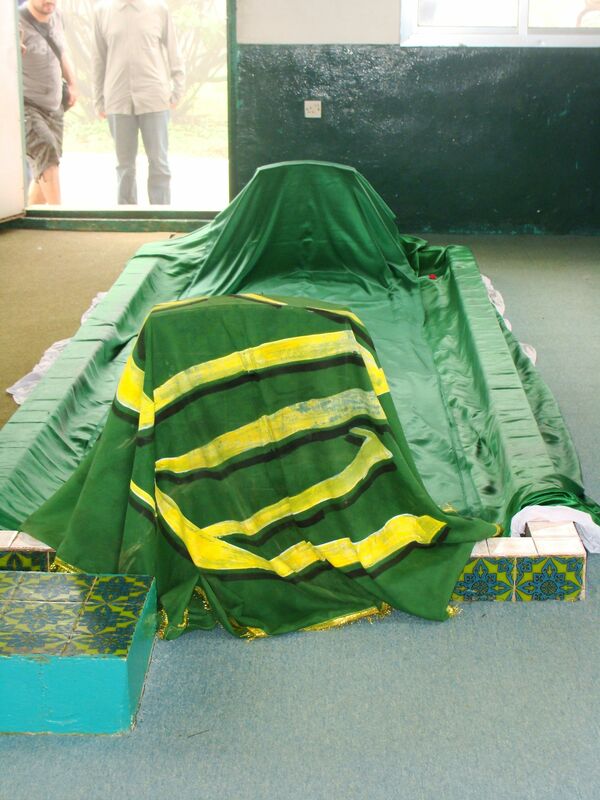 For the first, the rain is an effect of a seasonal monsoon that touches the very southern part of Oman (Job’s tomb is cradled in the coastal mountains near Salalah) each August. The phenomenon greens the whole area and makes it a tourist destination for vegetation-starved pilgrims from across the Arabian peninsula. To westerners, the idea of spending a week in a light drizzle might be better satisfied by a visit to London. But to locals, nothing seems to make them happier than a celebration, or even a roadside picnic, in the rain. For the second, the Prophet Job was (along with all the earliest members of homo sapiens) supposedly a giant. Thus his sarcophagus measures about 9 feet long while a footprint alleged to be his is preserved (in concrete!) outside the shrine. One further oddity of the tomb: the relics of an abandoned mosque abutt the rear wall of the building. It appears to be very ancient and, from what I could tell, it seemed that the qibla, or prayer niche, faced in a direction toward Jerusalem rather than toward Mecca. This could possibly date the building among the very earliest in Islam, from before the time when the Prophet Muhammad (PBUH) changed the direction of prayer. Omani friends: please comment if you have more information on this directional change.